One of the things I wanted to accomplish after purchasing my first home with my husband last fall was renovating the flower beds. We have a long flower bed that goes down the side of the house, but it was looking fairly shabby. It had some fern-type bushes, which weren’t bad, but they were suffocating in about a foot of mulch. If you look in the first photo, you can see the mulch line on the foundation. It was like the previous owners just kept piling on mulch instead of doing actual work to the bed. This spring, I changed that. Over several weekends thanks to weather and busy schedules, my husband dug out all of the mulch, taking the bed down to the dirt. Then, even though the bed had a liner down, we had to weed the whole thing and pick out plants. I’ll be honest, I broke the bank on the plants. Using my trust Lowes’ card (5 percent off is 5 percent off) I spent probably a little over $100 picking out plants for both the flower bed/garden and some pots I’ll post about later. In the flower bed, I decided to keep the bushes and a gorgeous Crepe Myrtle at the end, which my mom trimmed, and added two types of perennials that should bush out fairly well over the new few years. Eventually, they should form an almost meadow-like feel. However, because they haven’t bushed out yet, I added a simple annual in the very front. It all came together very well and everything seems to be growing nicely. Plus, the butterflies seem to really love it. I can’t wait to see what it looks like next spring. We just re-weeded everything and added additional mulch so it should be ready for fall. Amazon, what are you doing to me? I’ll start off by saying I’m a loyal Amazon shopper and I have been for years, even back in the early 2000s when it was really limited to basically just books. As a college student, I signed up for Prime using the student discount and continued to renew it without pause. However, recently my renewal hit a snag. Like most Amazon shoppers, up until recently I had a variety of payment methods linked to my account, many of which were expired and only on there because I hadn’t thought it necessary to take them off. Imagine my surprise when I find out one of those old, very much expired cards was used in January to renew my Prime account. The card used was not only expired, but had been paid off for years. Since a big part of credit scores now are how long you’ve had credit, I kept it open since it was my oldest card. I never imagined Amazon would use it, not only because it was very much expired, but also because it wasn’t the payment method on file for my Prime renewal. By the time I found out what had happened, I had already missed two payments on the card, earning me $60 in late fees. I immediately called the card company and was able to get one reversed, but then had to call Amazon and explain the issue. They were very apologetic for the mix-up and credited back the $99, covering my 2015 Prime renewal fee because of their mistake. Once Amazon credited back their side of it, I was then able to call the card company and get the other fee, plus the interest charges credited back, sending me back to a zero balance where I belonged. I thought everything was straightened out until I was notified the next day that my credit score had dropped–37 points–because of the two missed payments. Really, that’s the part that ticks me off the most. I never miss a payment and I can’t stand the idea that now I look like a delinquent person. This should help you avoid any random card charging issues like the one I just experienced because believe me, you don’t want to have to deal with this mess. And yes, I’m still a loyal Amazon customer, but had they not been so apologetic I may have changed my stance. My husband’s grandparents celebrated their 50th wedding anniversary last summer and when we were planning our wedding, I heard that they didn’t have a copy of their wedding certificate. Now, honestly, I have no clue where ours is and it’s only been a little over four years, but I was able to hunt theirs down at the local courthouse. 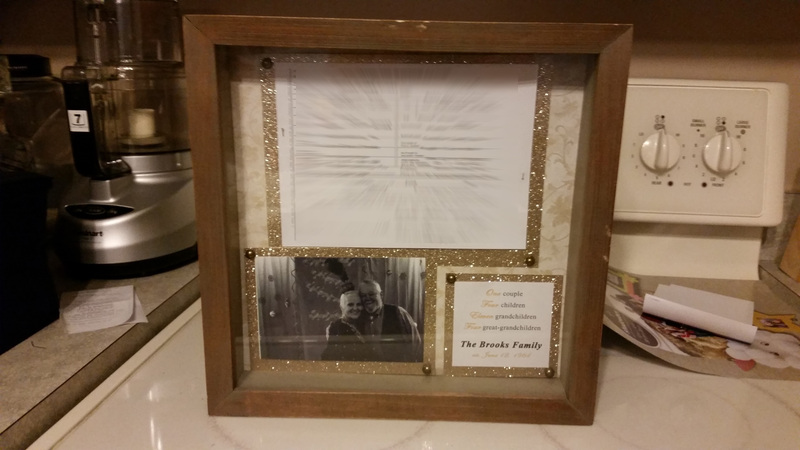 For theirs, I created a nice shadow box to put it on display which also doubled as an anniversary gift. Really, I need to this for my own when I hunt it down. 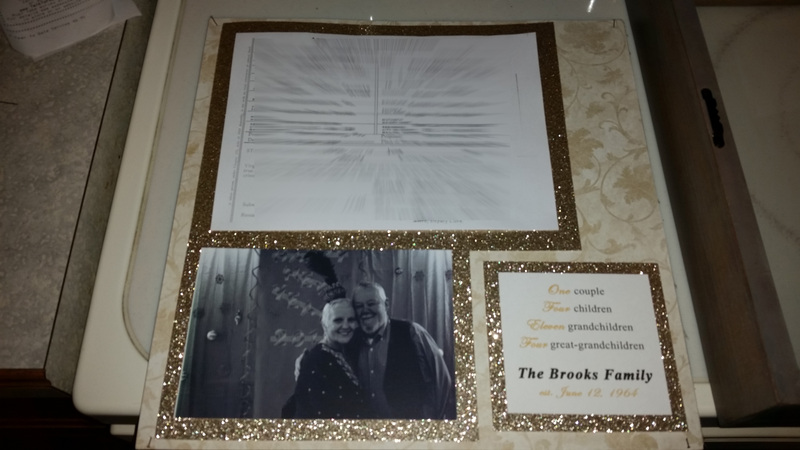 This gift can easily be created for a wedding, anniversary or really any other occasion and could easily be used for a birth certificate, diploma or any other piece of paper you wish to display. Start off by hunting down the certificate you wish to display. Birth and marriage records can be obtained from the local courthouse. Finding the marriage certificate I used was actually fairly easy. I had both of the names (important) and took them to the courthouse of the county that I knew there were married in. The clerk easily looked it up and helped my find the right one among the gazillions of paperwork they had on file. They made a photocopy and I was on my way. 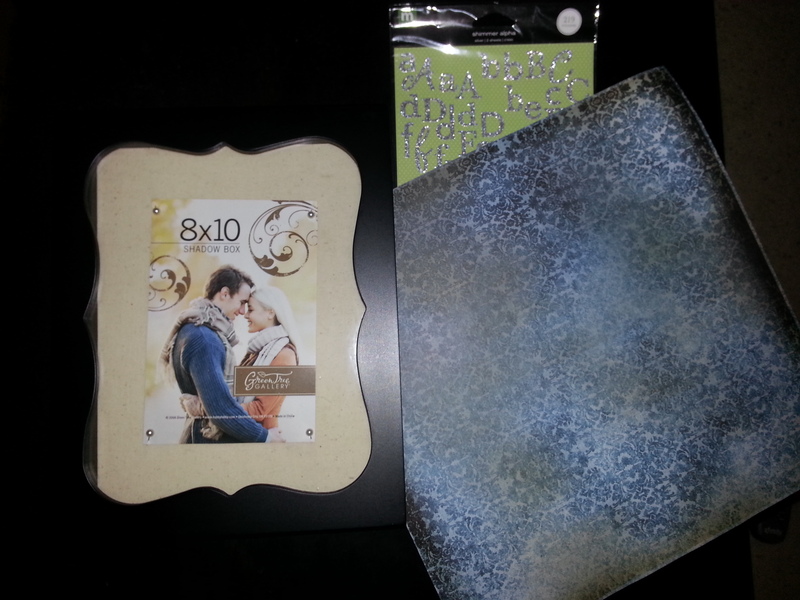 Next, I picked up my shadowbox (I found mine at Target) and bought my scrapbook paper. I chose a gold patterned piece, since the 50th anniversary is typically the golden anniversary, and a piece of gold glitter paper. Once home, I created a little sign using Photoshop and printed a photo that I had on file. I don’t love the picture, but it was the most recent one I had. I then used plain straight pins and affixed the patterned piece of paper into the back of the shadowbox, using one pin in each of the four corners. I then trimmed my glittery paper using the sizes of my certificate, sign and photo as a guideline. I made the glittery paper slightly larger (about an inch and a half on each side) than each of the items to allow the glittery to create a contrast between the item and the background. Using my double sided tape, I affixed each item to its corresponding glittery paper. Using the decorative pins, I pinned each item into the box, starting with the certificate at the top and then the photo and sign under it. After adding back the piece of glass (this shadowbox worked like a photo frame and not like some that I’ve seen that open on hinges) I wrapped it in tissue paper, put it in a bag and was on my way. So there you have it. A nice, personalized gift that someone is sure to love for their anniversary, birthday, graduation or more. 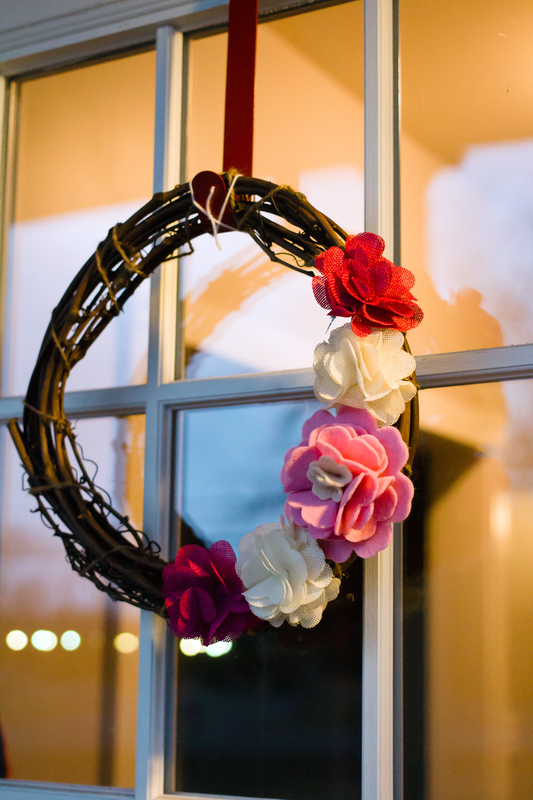 I ended up working a lot this week and didn’t get around to making Valentine’s Day wreaths until today, yep Valentine’s Day. Luckily, they’ll make an easy transition to spring since they aren’t overly holiday-ish. To keep things simple and easy, being that I was on a time crunch and all, I combined pre-made embellishments with rustic-style wreaths. 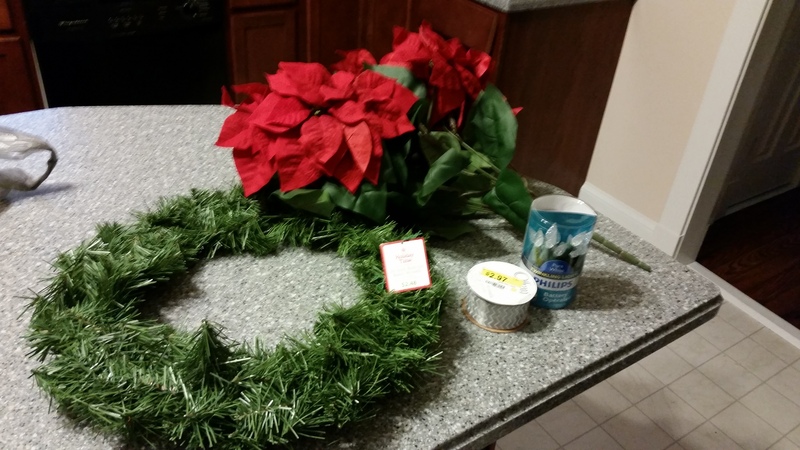 The wreaths I picked up in the dollar section of Target for $3 each. One was a little bent, but at $3 I can’t really complain. 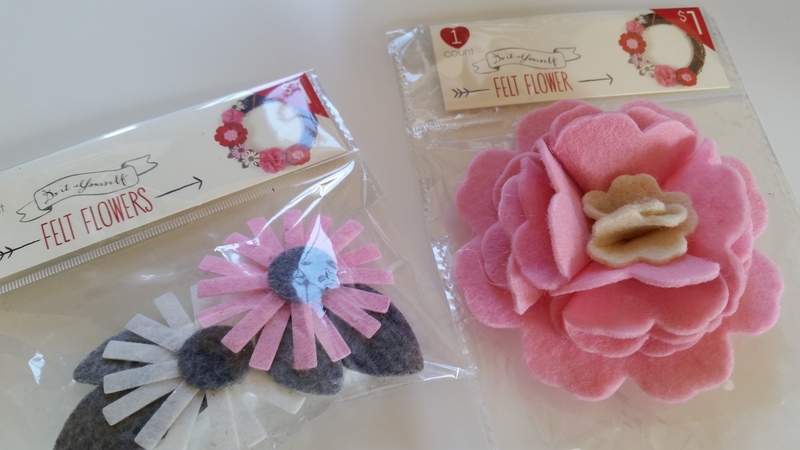 To go along with them, I also nabbed a pink felt flower for $1. 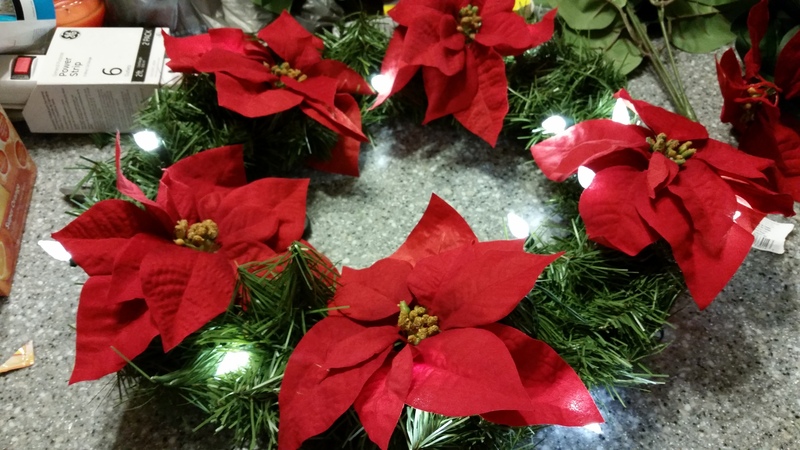 The flower is attached to a clothespin which makes it easy to attach to the wreath. 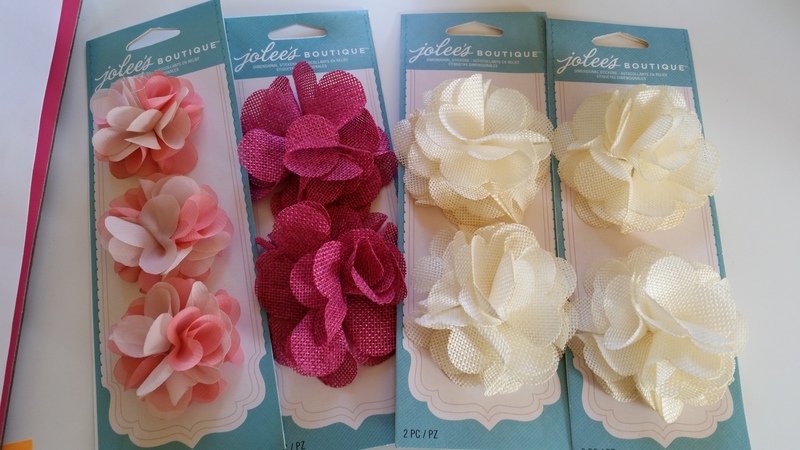 I also picked up three-dimensional burlap floral stickers by Jolee’s Boutique. I had never seen them before, but I fell in love with them and the burlap matched the style of my felt flower. Plus, they were on sale for half off so $2.99 for each, with each containing two stickers. Score! In the floral section, I picked up some bright pink flowers for $5.99. Not on sale, but not horribly priced either. 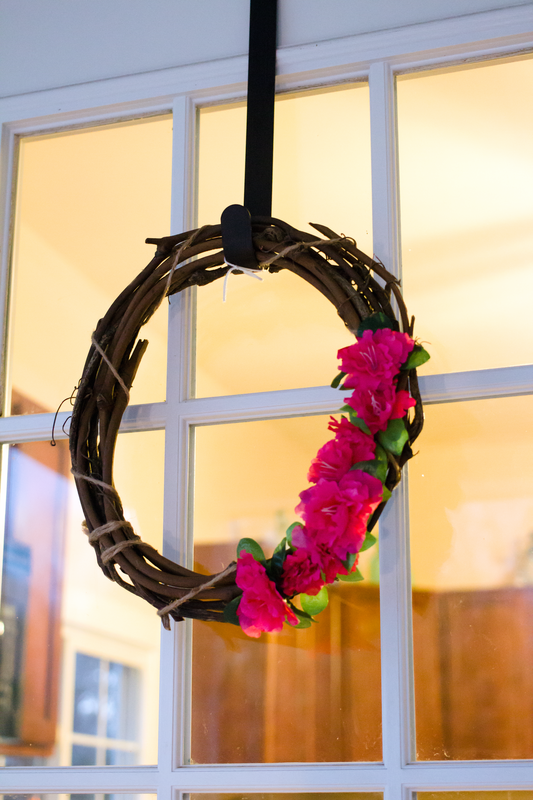 For the first wreath, I used the pink flowers, pulling them into individual stems and then wedging those stems down into the grapevine wreath material. 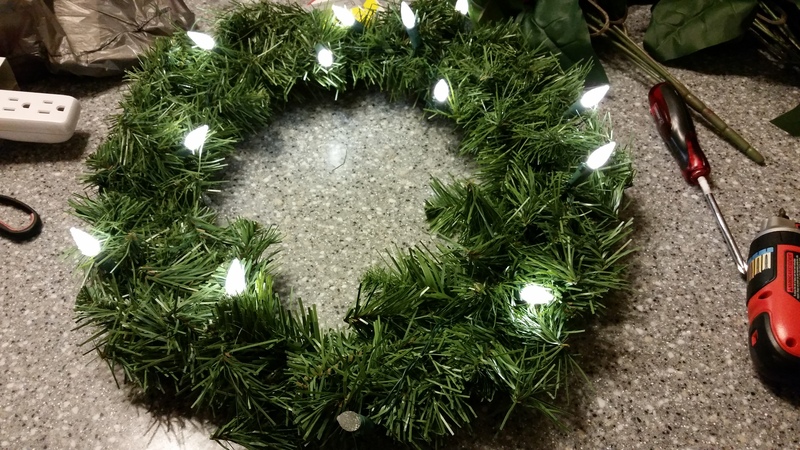 It took about five minutes and bam, I had a wreath. For the second wreath, I attached the felt flower first, using the clothespin to hook onto the grapevine wreath material. Then, using the twisty tie attached to the back of each flower sticker to wrap around the grapevine, I added two cream flowers and two pink flowers. Again, five minutes later, I had a wreath. And now both my front and back doors have a nice, festive pop of color on them all for less than $10 each. Happy Valentine’s Day! Thirty One and cardboard equals genius! If you’re like me, you have at least one Thirty-One bag. If you’re unfamiliar with Thirty-One, now is the time to check it out here. You’ll thank me later. Anyway, what is the most popular thing in Thirty-One’s lineup of products? Utility totes! I have the large utility tote, I have the deluxe utility tote, I have the zip top organizing utility tote. You get the picture. 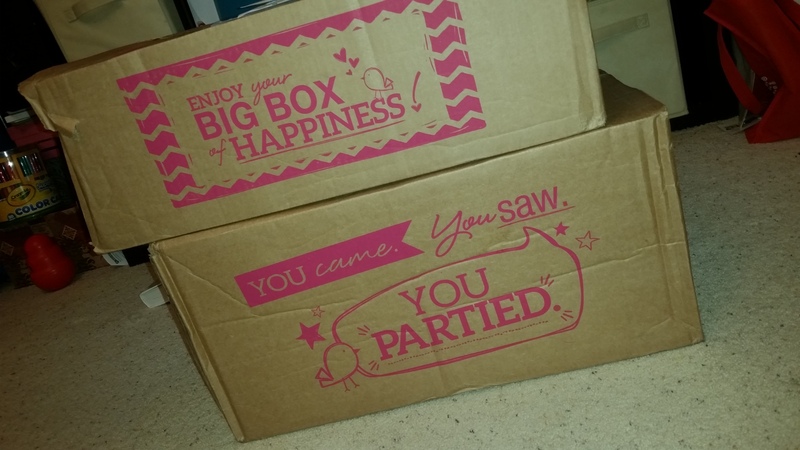 Now, Thirty-One is a smart company and they don’t just make the totes. Oh no. They make tops for the totes, attachable pouches for the totes, etc. etc. but there’s still an issue. A majority of the totes have soft bottoms. This is fine if you’re tote is maxed out full, but not so great if isn’t. 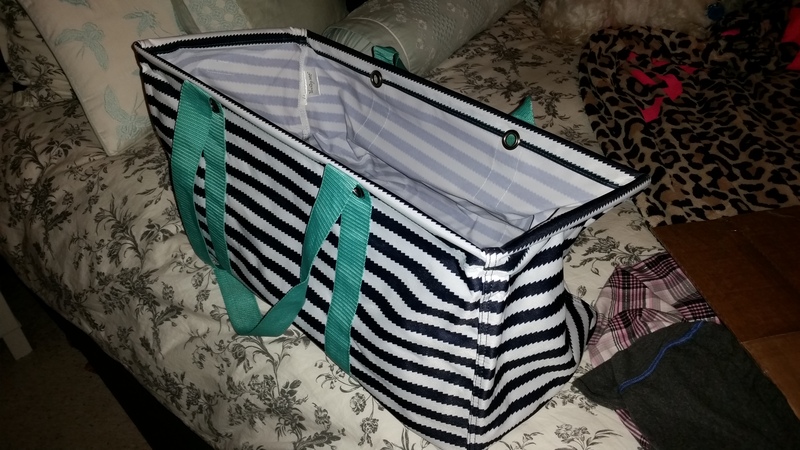 So behold, I give you the life hack to end life hacks–a hard bottom for your Thirty One utility totes. It’s fairly simple. You need cardboard, scissors and some waterproof tape. I used packing tape, but you could probably use duct tape, especially the super cute stuff with the bright colors or fancy patterns. I didn’t have that on-hand, so clear tape it was. 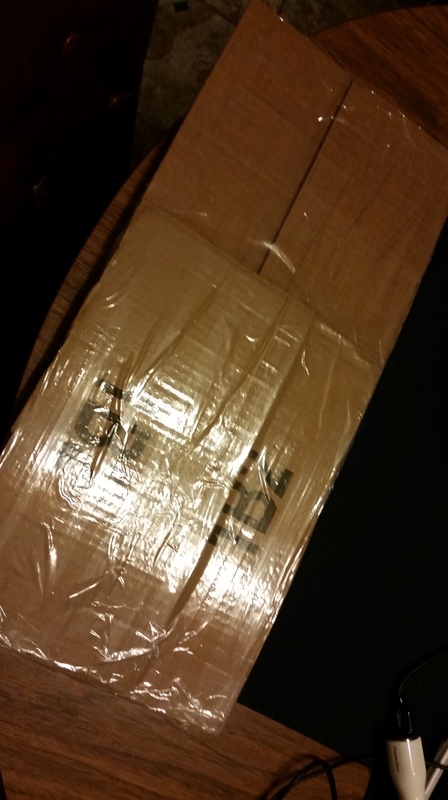 For my cardboard, I used the flaps off an Amazon box. I’m an Amazon junkie so it’s no surprise I had one of these laying around. Any cardboard will do, but this enabled me to re-purpose something I already had on hand. Using your scissors, cut the flaps off the box. Then, take the flaps and push them into the bottom of your utility tote. This is to get a measurement for how long and wide the bottom will need to be. Make a mark on the flaps where they need to be trimmed. Taking them out of the bag, trim them in the necessary spot to ensure you get the proper length to cover the bottom of the bag. For width, I found that I had to tape two flaps together, overlapping one slightly with the other, to get them to cover the bottom of my bag. This may not be necessary depending on how wide your cardboard is. Once everything is cut and the two are overlapped (if necessary) tape everything together. 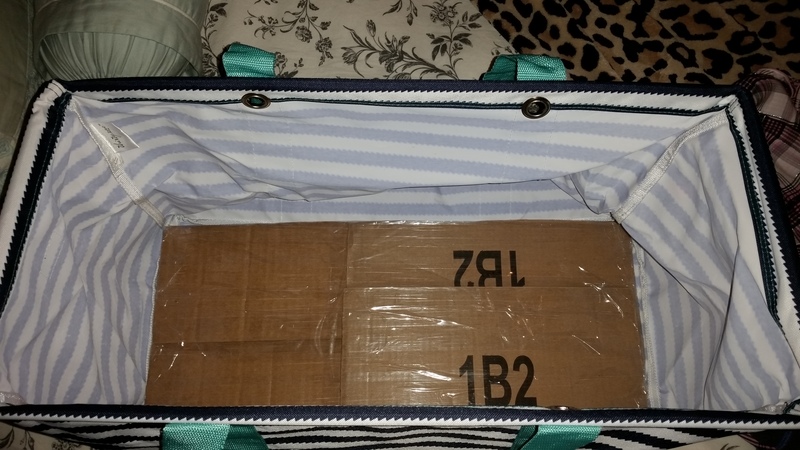 Be sure to cover every inch of the cardboard, front and back, with tape to prevent them from getting wet in the bottom of the bag and bending. When you’re finished, pop your new cardboard bottom into the bottom of your bag and voila, you now have a hard bottom utility tote. Now you may be thinking, this is just cardboard and tape. It’s not going to hold up. I assure that’s not the case. I fashioned these bottoms for two of my totes right before I took them on a week-long beach trip. These bags were carried out to the beach everyday, occasionally became a home for wet towels and picked up a little sand along the way and they stayed perfect. I’ve since used the same bags, with the same cardboard bottoms, for a weekend beach trip, pool trips, moving, hauling Christmas presents and more. I have yet to have to remake a bottom or had any issues. Fabulous! 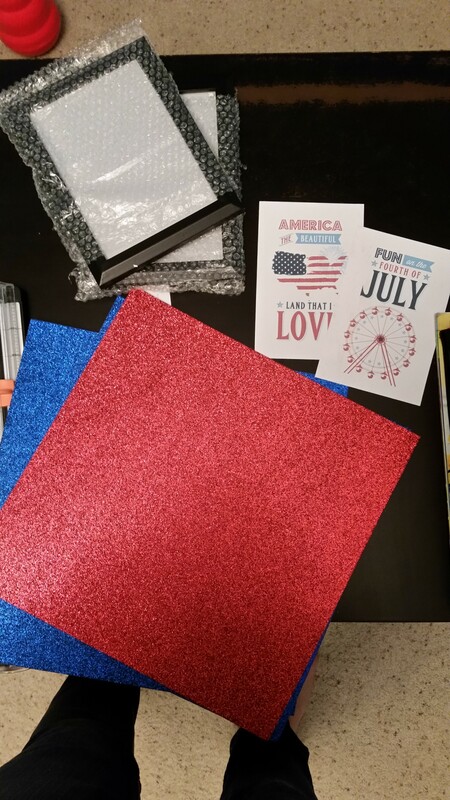 I’m still counting my way down to the fabulous fourth, so here’s another festive and fun DIY project to get you in the mood for hotdogs and fireworks. 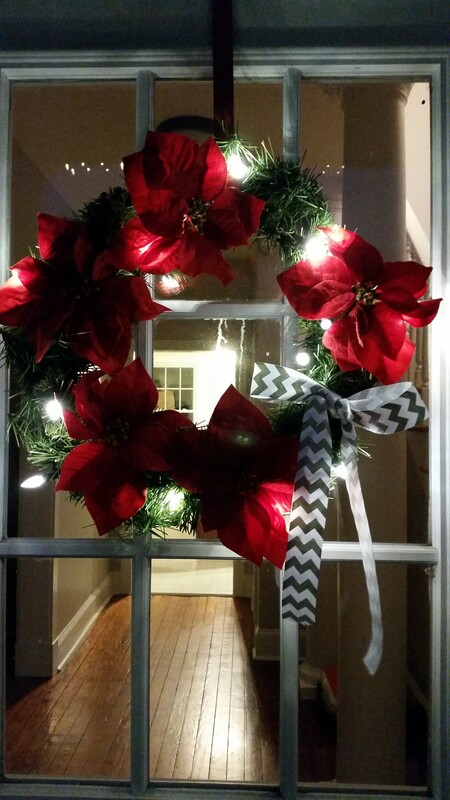 In my first post I showed you how to make a festive door hanger. Now, I’m going to show you how to make some awesomely festive glittery picture frames. Start out by printing off your chosen designs. Make sure you print them 4×6. Two should fit on one piece of card stock. Using your paper cutter, carefully cut out your designs and set them aside. Using your paper cutter, cut each piece of glittery paper into a 5X7 rectangle. 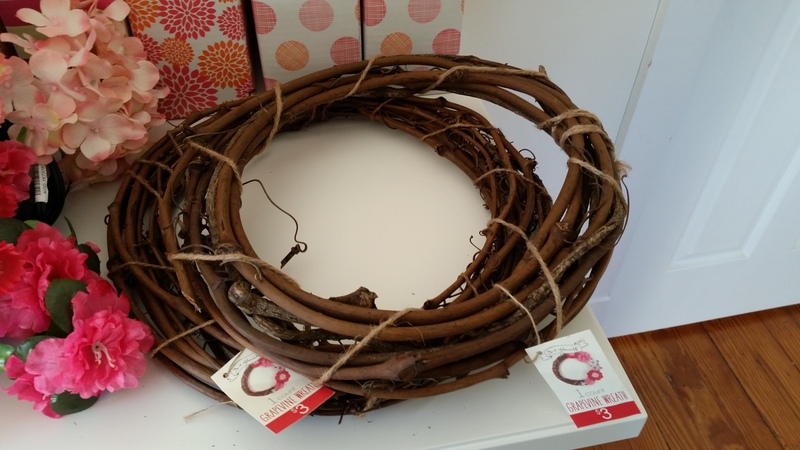 Be sure they measure exactly 5×7 or they won’t fit in the picture frames and will require additional trimming. With your first design, which you’ve cut into a 4×6, center it on the 5×7 glittery rectangle. Adhere it to the rectangle using glue or scrapbook paper adhesive. I used scrapbook adhesive, running it around all of the edges of the back of the 4×6 design. It takes more than a few dots to make it stick to the glittery paper. Repeat the previous step using the second 4×6 design and the second 5×7 glittery rectangle. Once both designs have been attached to their glittery counterparts, open the photo frames and place each design in them. Note, the frames may need to be cleaned first with glass cleaner as new frames are sometimes fairly dirty inside. Close the frames, wipe off any fingerprints on the glass and place each in the perfect location around your home. Viola! Another fun, festive project complete. It’s almost the fourth of July! I love summer holidays. There’s just something about getting together with family and friends, snacking on a bunless hotdog (gluten free at barbecues is a challenge so you make do), and fireworks that make me excited. It also doesn’t hurt that summer is my all time favorite season. 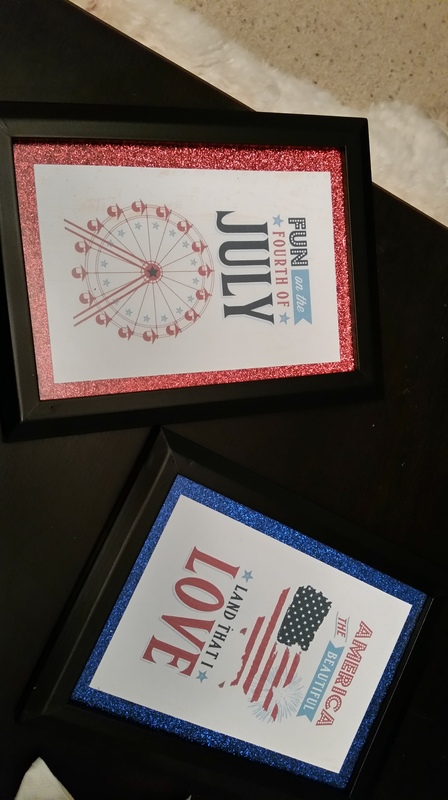 So, to gear up for the fabulous fourth, I’ve been DIYing like a crazy person. 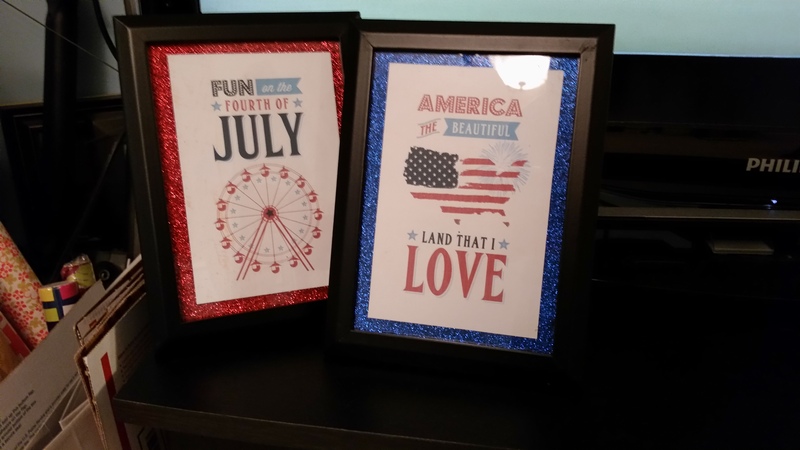 Seriously, overnight my apartment went from spring/summer-ish to patriotic passion. 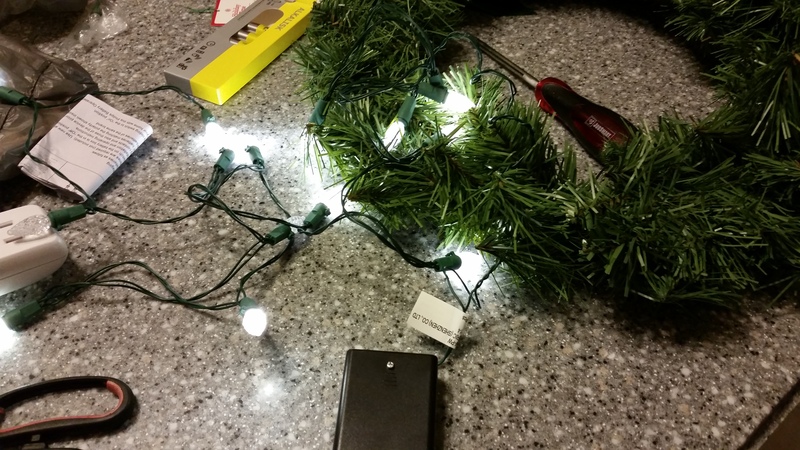 I want to share some of the fun, so each day leading up the fourth I’m going to share a different festive DIY project. Up first, is this awesomesauce door hanger. I had been looking at ones in the craft stores and they just didn’t have what I was looking for. Many of them were sort of vintage patriotic and I’m not a huge fan of that, plus, they were expensive, so I made my own. 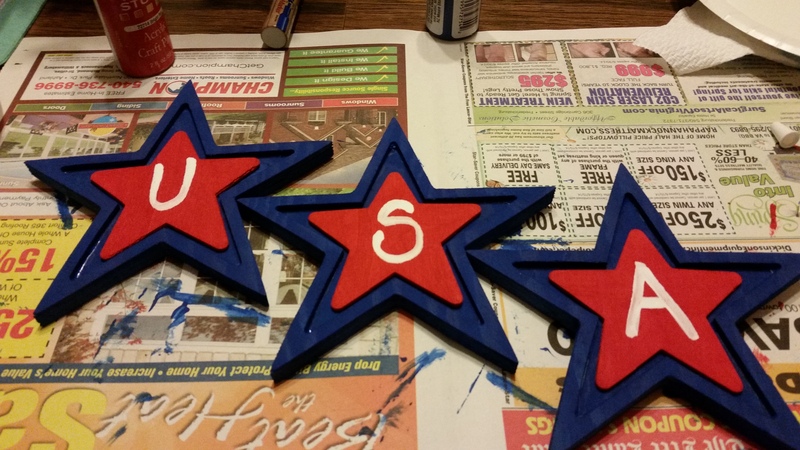 Start by painting the large wooden stars with a coat of blue paint. 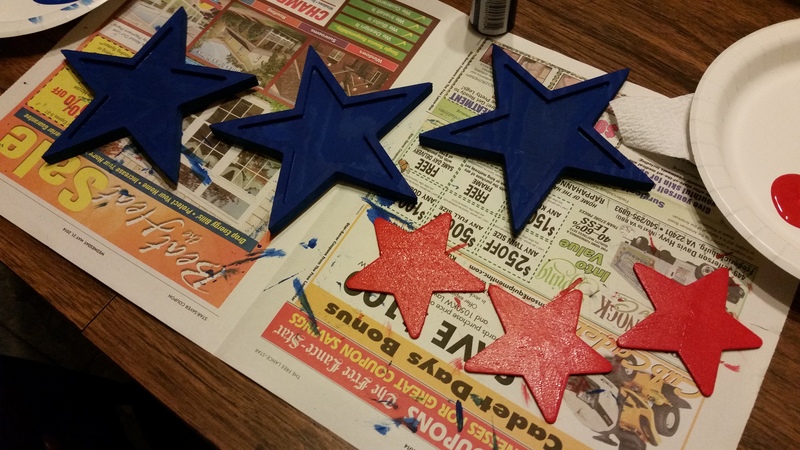 While they’re drying, paint the small stars with a coat of red paint. Put a second coat on both. Depending on your paint and your stars, a third coat may be needed. If necessary, apply a third coat and let dry. 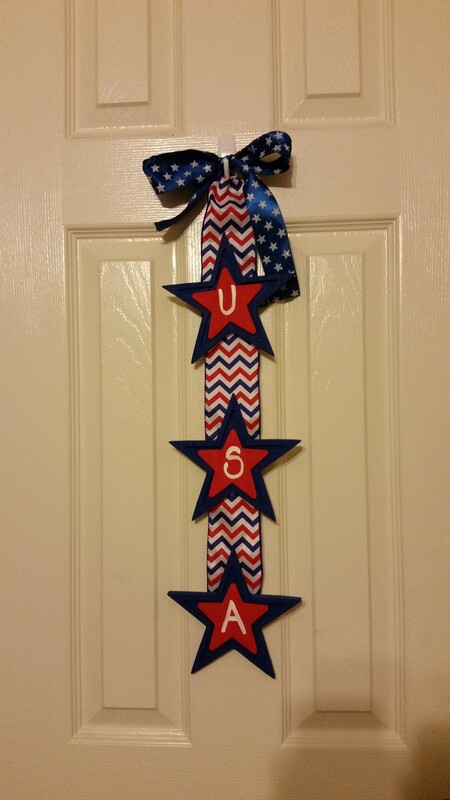 Using the white paint pen, draw one letter each on the small stars (U-S-A). If necessary, trace over the letters to apply a second coat. 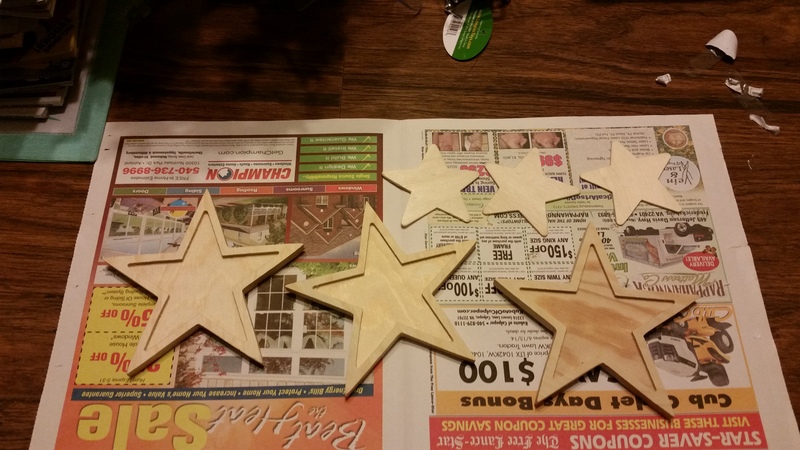 When dry, apply tacky glue to the back of the U star and glue it onto the large star, placing it in the center. Repeat for the additional two letters, centering each on a separate large star. Cut the first ribbon design into two even pieces. Also cut one longer piece. Using the ribbon, attach one of the even pieces onto the top of the A star. Secure it with both glue and a thumbtack to the back of the star. Attach the top of the same ribbon, using both glue and a thumbtack, to the back of the bottom of the S star. Using the second even piece of ribbon, attach it with both glue and a thumbtack, to the back of the top of the S star. 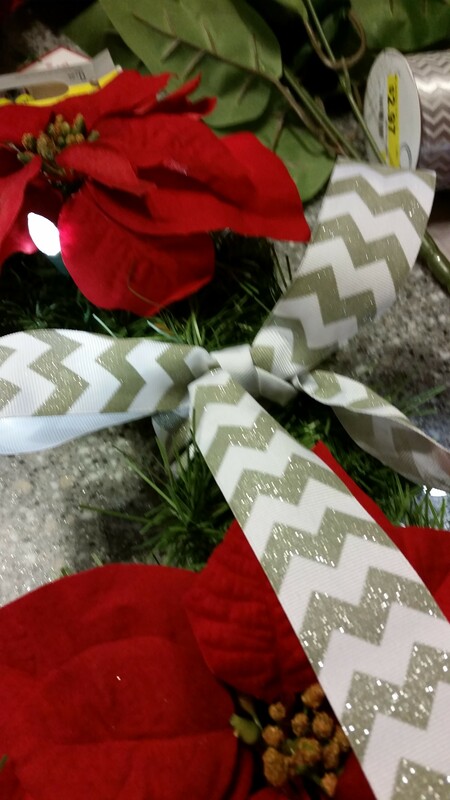 Attach the top of the same ribbon, using both glue and a thumbtack, to the back of the bottom of the A star. 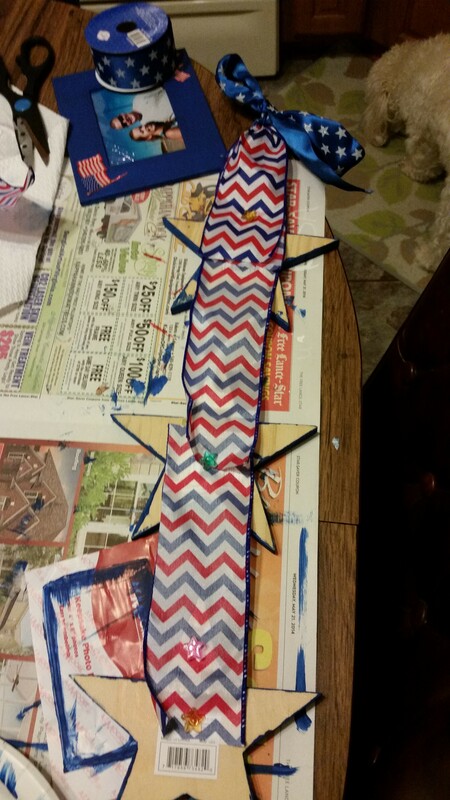 With the slightly longer ribbon, attach the end, again glue and thumbtack, to the back of the top of the A star. Take the top of the same ribbon and form it into a loop, attaching it to the back of the top of the A star. 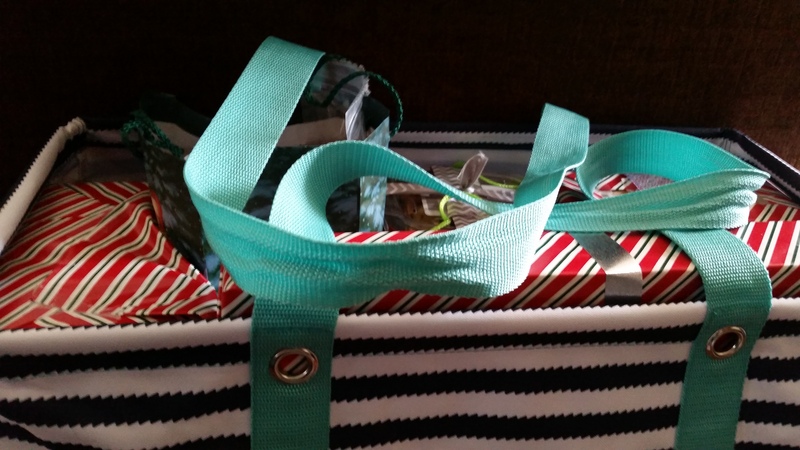 With the second ribbon design, tie a bow through the loop to hang the hanger up. I used a 3m hook and stuck the knot of the bow through the hook part of the 3m hook. Stand back and admire your patriotic masterpiece. 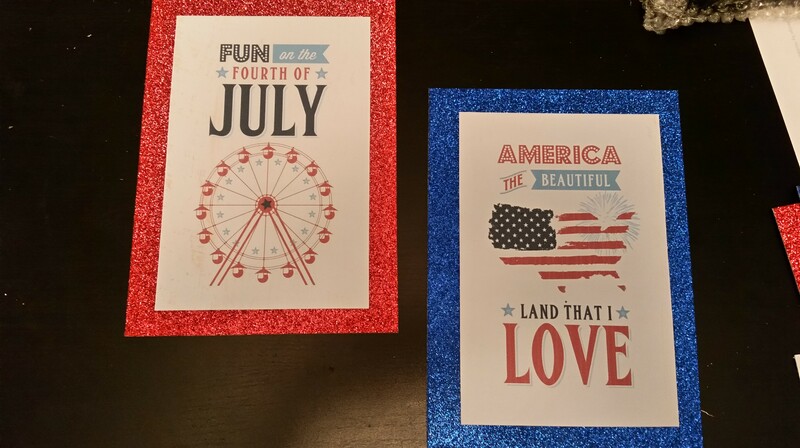 Happy almost fourth of July you DIY diva you. I finally found a fun way to display ticket stubs, Carnival passes and more. I’ve been collecting this stuff for 10+ years waiting for some idea on how to display it. Thanks to Pinterest, my mementos are no longer collecting dust in old shoeboxes. Behold, the ticket stub memory box. To make my box, I took a trip to the local Hobby Lobby store to purchase one shadow box (I used an 8×10, but I really should have gone larger) and a piece of scrapbook paper for the background. I chose an antique looking blue pattern, since my living room has blue accents. For the letters, I used glittery stickers I already had at home. After measuring the inside of my shadow box (the outside is 8×10, not the inside) I cut my paper to fit and attached it to the inside of the box using four small stick pins, one in each corner. Using my letter stickers, I spelled out “Admit One,” and then filled the box with all of my mementos. 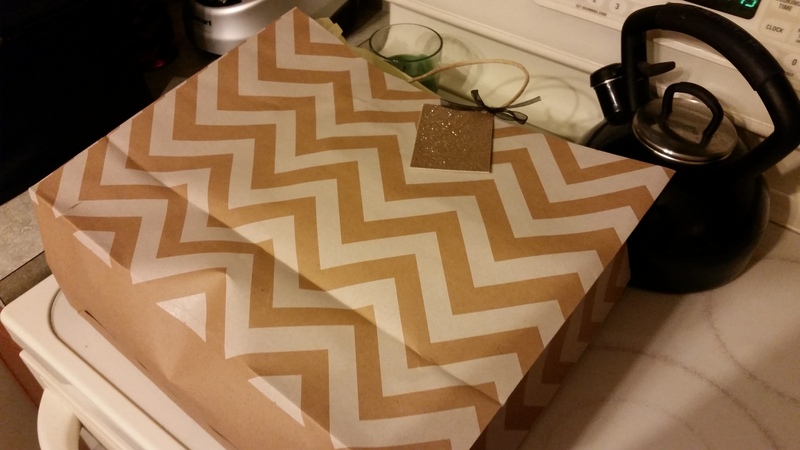 The whole project was super easy and took maybe 15 minutes once I had purchased the supplies. 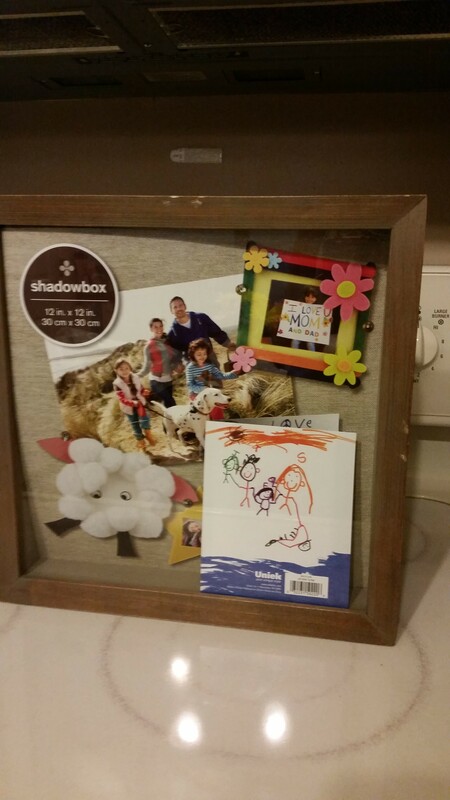 Plus, it was less than $20 bucks since I had a 40 percent off coupon for the shadow box. I saw a similar project going for $150 on Etsy. Maybe I need to get in the Etsy business.